Out of all that you make what are your favorite pieces? My “favorite piece” is always changing because everything in flux and I’m in constant competition with myself to improve and make better work. At the moment, this wild alien flower pendant is my most prized piece. It’s large and fairly impractical, but coming from a background in sculpture, that is often what I am compelled to make. Someone recently described it as “very Lovecraftian” — it hadn’t even occurred to me beforehand, but she nailed it: I often listen to audiobooks while working in my studio, and had listened to a few H.P. Lovecraft audiobooks the week before I made it. I love how subconscious influences seep into creation. Could you discuss a little bit about your process from the start of an idea to a finished piece? 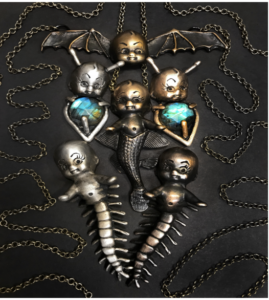 I use many different techniques to create jewelry, but most prominently are metal fabrication and 3d printing. 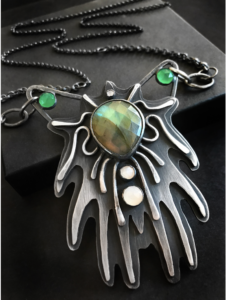 Often with my handmade silver pieces, I start out with a gemstone and let it decide what to be: necklace, ring, statement piece, tiny piece, bat, creature, etc. I have a collection of shapes that I consider to be my “language” and I’ve created hundreds of 3d printed stencils from these forms. 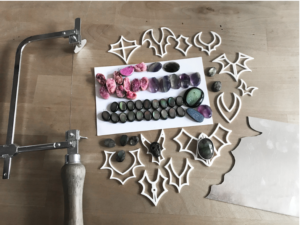 I choose a stencil that compliments my stone and I build a composition with additional gems and shapes, tracing it onto raw silver sheet. The rest of the process involves manipulating the sheet metal and silver wire using saws, hammers, and torches. I finish most of my work with a heavy dark patina – I am not a fan of bright shiny metal. 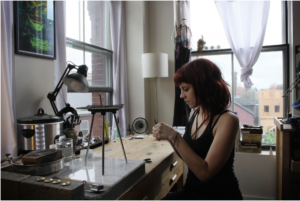 Aside from using it to make stencils, 3d printing has been an integral part of my jewelry process for years now. 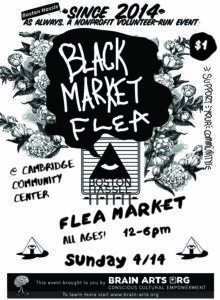 I learned how to sculpt digitally through CAD programs and became very attracted to the matte black polyamide material I was printing my designs in. Working in both mediums allows me to exercise both the analog and digital parts of my brain. I am constantly switching between the two, which I find keeps me inspired and prevents artist’s blocks. Sterling silver, labradorite, white moonstone, green onyx, bronze moon accents. The term “witchy” often conjures visions of romantic Edwardian and Victorian fashion, dreary days, hanging dried herbs, poetic passages, melancholia… While I do have an appreciation for these classic aesthetics, they are exactly not my realm. The “space witch,” as I see it, is a different animal: a phosphorescent purple bat flying into the endless void of space, radiating with tongue-in-cheek existential dread; atomic, vampy, unnatural and psychedelic. Inspired by mid-century aesthetics, pointy black things, and glamour ghouls like Vampira. “Kewpede” is brilliant and absolutely righteous. You describe a lot of your inspiration has manifested from your environment from your childhood. Could you give us a time or a memory you knew this is what you wanted to do or maybe the moment you entered the realm of the space-witch? I’ve been compulsively creating art since for as long as I can remember. As a kid, I was kind of an outcast and an only child, so I spent a lot of time by myself drawing monsters, reptiles and carnivorous plants.I knew at a young age that making things and collecting inspiration was a really important part of who I was as a human, and it was strange to me that other kids didn’t have skull collections or tape dead bugs to their walls. I have distinct childhood memories of jumping out of bed at 3am to sketch out painting ideas or write down sentences that came to me in dreams. Looking back, I would consider those to be my earliest experiences with “artistic mania,” the frenzied electric feeling that still fuels my work as an adult. How would you describe yourself to the world? Jewels to wear in the twilight zone.